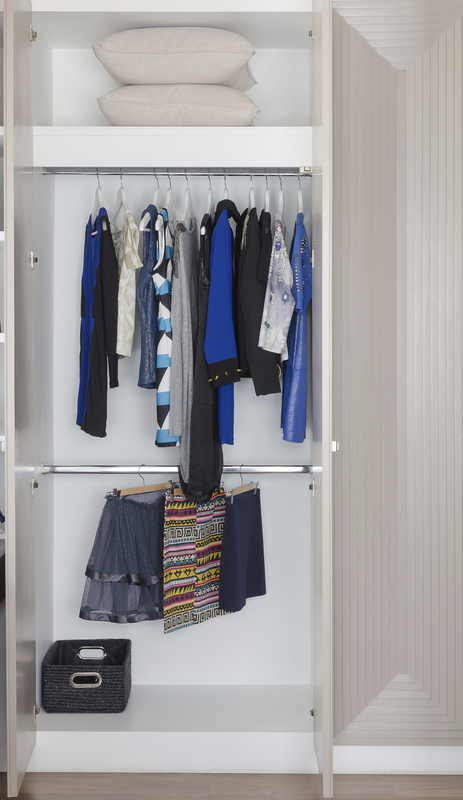 Once you’ve organized your closet you’re all set – ready to move on and forget about your closet right? Think again. To keep your closet and your clothes in tip top shape you need to have maintenance habits in place. Let’s think about this. In the morning, you select your clothes and get dressed. In the evening you come home from work or school or play and put on your ‘around the house’ lounging kind of clothes. I don’t know about yours but mine are comfy clothes – sweat pants and top. What did you do with the clothes you took off? Did you put them in the laundry basket to be washed? Did they go into a bag for the dry cleaners? Can you wear them again? If so, did you hang them back up or fold them and put them away? Or did you leave them laying on the floor? As Sheila McCurdy says “The floor is not an option”. You have many other options but if you leave them laying on the floor they will become wrinkled, stepped upon, and unwearable until they are cleaned. Consider this, you’ve paid good money for these clothes and you want to have them last and stay looking good for as long as possible. The best way to do this is to examine your clothes when you take them off. Is there a stain from lunch today? Quickly treat it and put it in the laundry basket or schedule your next trip to the dry cleaners. Can you wear this outfit again before cleaning it? Great! Hang it up. This way many of the wrinkles will hang out and it will be in your closet ready for the next time you decide to wear it. If it’s not stained and not wearable again either put it in the laundry basket or schedule a regular trip to the dry cleaners. When you take care of your clothes in this way your closet stays tidy and you stay in control of your inventory of clothes. You take the time to put your clothes away where they belong so you will know where to look for those items. You know if something needs cleaning or mending. You have scheduled time to take those clothes to be fixed or you have scheduled time in your calendar to fix them yourself. What if it’s beyond repair? Or if you don’t want to spend the money to repair it? Either toss the item or donate it. Perhaps someone else will be able to repair it. Maintenance is a key component. When you do a little daily maintenance you don’t find yourself in chaos. Write me back and let me know how you maintain your closet. This entry was posted on August 12, 2015 at 12:58 pm and is filed under Uncategorized. You can follow any responses to this entry through the RSS 2.0 feed. You can leave a response, or trackback from your own site. I think half the battle in keeping closets organized is what you do with the clothes you wore. It’s so hard for that chronically unorganized person to get out of the habit of using the floor. I love your tips and getting to the point. Excellent. Great post Diane! My closet is a mess and is next on my DIY Organizer Series! I love these tips and will use them when I do my own closet. Thanks!